There may be nothing more unnatural in the human experience than the death of one’s child. Israeli author David Grossman endured such a trauma, when his youngest son was killed in the Israeli-Lebanon conflict of 2006. Turning his personal grief into words in 2014, Grossman penned Falling Out Of Time – a deeply personal novel which has now been published in some thirty languages. This week, Theatre J in Washington, D.C. premiered an engrossing, immersive adaptation of Falling Out Of Time. 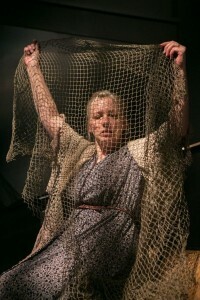 Adapted and directed by Derek Goldman (from a translation by Jessica Cohen), Falling Out Of Time threads the stories of nine sullen individuals – all are struggling with the anguish of losing a child. Each story is unique, but the common denominator is the walk of life every parent must make, often taking steps for a son or daughter who is no longer there. The language in this adaptation is thought-provoking and beautiful. Credit here is due – not only to Grossman and Cohen – but also to the ensemble. There were places on opening night when some of the dialogue sounded a bit affected, but for the most part, the cast puts this show over by delivering difficult lines with feeling and compassion. Moving performances are offered by Joseph Wycoff (Man) and Leo Erickson (Math teacher). Nora Achrati (as the empty-handed Mid-wife) and Nanna Ingvarsson (as the Chronicler’s wife), are more subdued, but no less solid in their roles. Theatre J regulars should be happy to find that the artistic team of the Helen Hayes Award Winning production of Our Class reunites for Falling Out of Time. Set designer Misha Kachman creates a simple but suitable space which allows each character room to transcend the confines of their closed existence. The immersive aspect of the production has a dozen or so audience members on the stage, while two rows of seats are blocked off to allow movement of the players around the auditorium. Both lighting (Colin K. Bills) and sound (Eric Shimelonis) work well in creating an other-worldly effect for the lost townspeople. Costume designer Ivania Stack’s turn-of-the-century furnishings help to draw the audience in, though the veiny undergarments are at best distracting. Falling Out of Time runs now – April 17, 2016, at Theater J in the Washington D.C. JCC’s Aaron & Cecile Goldman Theater,1529 16th Street, NW in Washington, D.C., (4 blocks east of Dupont Circle). Running time is ninety minutes with no intermission. On Sunday, April 10 at 7:30 p.m. the show will have open-captioning for the hearing impaired. There will be a special noon matinee on Wednesday, April 6. Stage seating tickets cost $35. Tickets and other information (including parking tips) are available at theaterj.org or (202) 777-3210.